Whitehall-Yearling High School students have the opportunity to take advanced placement classes as well as college classes from Columbus State Community College. Students at Rosemore Middle School have the opportunity to take high school classes for high school credit in math, English and foreign language. Virtual learning classes for credit recovery are also available for students. Whitehall City Schools are well equipped for preparing students for the information age. The district maintains 2,000 computers and an extensive network for staff and student use including work productivity tools, e-mail and Internet access. All classrooms are equipped with “smart” technology to enhance the learning experience of the students. The district is a charter member of the Eastland/Fairfield Career and Technical Centers, which provide career training programs for business, technology, agriculture, medical and dental assistance, trade and industrial occupations. 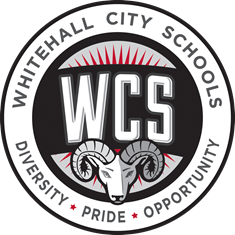 In addition, Whitehall Schools provides an award winning fine arts program including visual and performing arts, vocal and instrumental music. The Whitehall School District has recently completed construction of five new school buildings thanks to the support of the community of Whitehall. These new facilities are state-of-the-art in terms of the learning spaces they provide for our students.